Need Professional Wall and Void Foaming for Termites? Use the Solo Professional Wall Foamer. The fast, affordable appoach to foaming wall voids and other hard to reach areas. 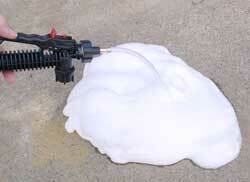 The Solo Professional Wall Foamer Makes Gallons of Foam! Its easy to fill, easy to pressurize and easier to foam ! Foam is dry consistency for better adherence and superior penetration into wood. When used as directed and mixed with a Termiticide, kills termites on contact ! Solo Professional Wall Foamer Makes Foaming Walls Easy! Looking for a fast efficient way to foam your favorite pesticide ? ePestSupply offers the Solo Wall Foamer. 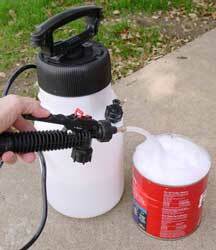 The Solo Wall Foamer turns any pesticide mixed with a foaming agent into a thick foam slurry similar to shaving cream. For termite control applications, the Solo Wall Foamer is a priceless tool that every person involved in termite control should own. The Solo Wall Foamer allows for fast easy foaming of wall voids and other hidden and concealed areas at a price hundreds of dollars less than comparable electric models. Why use foam ? Because liquid pesticides don't absorb evenly into wood. The Solo Wall Foamer allows pesticides to slowly absorb into wood over several hours resulting in 100% penetration. The Solo Wall Foamer comes with a 2 Year repair warranty. What more could you ask for ? Fast, efficient wall foaming, a durable professional quality foamer and a 2 year warranty. This foamer makes sense and foam, lots of foam! The Solo Professional Wall Foamer is available directly to building maintenance workers, homeowners through ePestSupply.com. Interested in Do-It-Yourself Termite Treatment ? Read on ! Foam Walls And Perform Termite Treatments Without Electricity! Most termite foaming tools that can inject gallons of foam require electricity and are very expensive. The B&G Versa Foamer sells for $495 and utilizes an electrical powered pump motor. It is a fantastic piece of equipment, but it does have its drawbacks. The Solo Professional Wall Foamer is hundreds of dollars less and is guaranteed against defects for 1 full year! The Solo Professional Wall Foamer is a specially designed hand pumping sprayer / foamer that makes gallons of foam, and does not require any special pumps, motors or electricity. It is perfect for home or building maintenance use, especially for treating areas such as attics, crawlspaces, warehouses, storage units and other areas where there is no electricity. No electricity needed. Just fill, pump and foam! Termite treatments sometimes involve drilling into slabs or cement and injecting a termite insecticide such as Optigard Flex, Premise or Termidorunder the cement. This forms a barrier which the termites must cross to enter the structure. This type of treatment for termites can also be very destructive to floors, especially tile, marble and linoleum. 1. Determine areas to be foamed. For wall voids, drill a 1/2 inch hole between every stud and about 6 inches from the floor. The entire length of the wall should be treated if practical. Locate all plumbing and electrical penetrations before drilling. Be sure when drilling not to penetrate electrical lines or plumbing lines. Drilling into the walls or voids creates a "foaming injection point". For cement blocks, drill both sides of block. Do not drill holes overhead. Make sure that all foaming injection points are located in a way so the the foam will not run out once it becomes liquid. Mix termite insecticide (Optigard or Premise 2) (sold separately) with foaming agent (Platinum Foam Concentrate) and water as directed. Usually 1-2 oz of termite insecticide along with 2-4 oz of foaming agent. 2. Shake Solo Professional Wall Foamer vigerously to create foamy lather. 3. Pump the handle up and down a few times to fill foamer with air. 4. inject foam into walls, voids, eaves, and other areas where termites are found. The normal rate of application is 1-2 gallons of foam for each 2 foot by 1 foot square area. 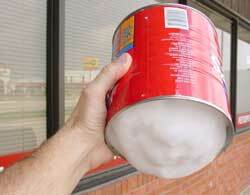 Dispense foam into a can or similar container to determine the rate of flow prior to injecting into walls. 6. Repair foaming injection points as needed with suitable repair material.